Paige and I were kindly sent the new Maxi-Cosi Loola pushchair to review earlier this month. 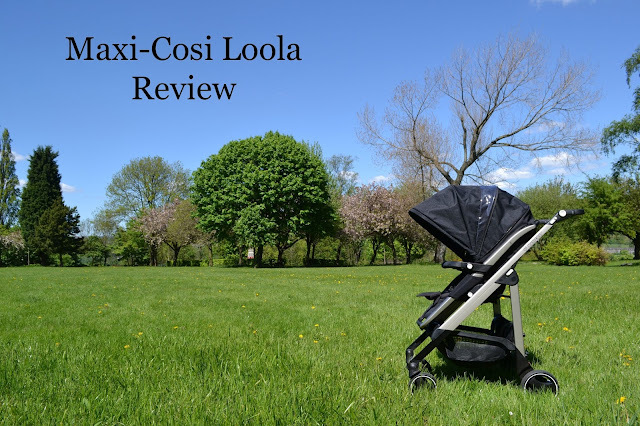 I was very eager to test the Loola out as Maxi-Cosi are a fabulous, well known brand. I was very excited about the Loola because I had read that it folds down with the seat unit still attached. 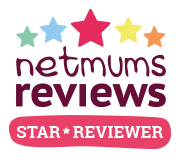 This is one of the things our current Mothercare MY4 doesn't do. It is so annoying having to take the seat unit off to fold the pushchair down. First thing is first, putting the Loola together. The Loola was very easy to put together. All that was needed was the seat unit and bumper bar putting on and the hood attaching. I actually found that attaching the hood was the hardest part. For some reason I thought that the hood, which attaches with a zip, zipped up but it zips down to attach it to the frame. The wheels were already attached and can't be removed but everything was ready to go after 10 minutes. The first thing I noticed about the Loola was the padding on the seat unit. It is very well padded and you know that with your baby safely strapped in with the 3 point harness, that they are going to be comfy and enjoy the ride. The next thing I noticed was the size. It was bigger than I thought it was and felt longer than our old pushchair. After using it for nearly a month it still feels quite big to me but I am only 5'3. I think it is more suited to someone taller, Mark thinks that it is the perfect height for him. Even in the most crowded urban area, you can slalom really easily thanks to its great maneuverability and its one hand driving handle. Bring your Loola anywhere you go as it folds in a flash, without having to remove the seat when folding it. Total flexibility they can clip a Carrycot or a group 0+ to switch easily from a car trip to a stroller walk. I love the fact that it folds down with the seat unit on. This makes it a very practical pushchair. With a baby or indeed a toddler you don't want to be messing around taking the seat unit off and then folding the frame down. Having a pushchair that folds down with the unit on just makes life a lot easier. Another thing I love is how small it folds down although it is quite long when folded, again this makes life a lot easier. The Loola is easy to store and easy to take on public transport if like us you don't have a car. It also feels sturdy. You can tell that it is a well made pushchair and that it will last you a while. The seat unit also folds flat so it is suitable for a newborn and great for when your baby/toddler is napping. I also love how far upright it sits. I always felt that Paige wanted to sit up a little more in her old pram and was never able to do so but in the Loola she is in the perfect position to look around and be nosy. To lay the seat unit down simply squeeze the handle and pull down. The seat unit can be parent facing as well as world facing. This is great for the early days when you and your baby want eye to eye contact, but it also means that when they get older they can face the world. Paige particularly likes this. Paige is a pretty big 1 year old and I always felt with her other pushchair that she looked too big and the unit itself was actually too small. With the Loola Paige looks comfortable and still has a lot of room to grow. The foot rest is also a nice feature. The hood is a particular favourite of mine. It has the little peep panel so you can easily keep an eye on baby but it also has a secret panel which is zipped, once you unzip this the hood extends and make an extra big hood, great for keeping the sun out of baby's eyes. Folding the Loola and opening it again is easy to manage but you do need two hands. You place the handle into the downward position then pull up on the two clips near the handle bar and push the handle up at the bottom of the pushchair and the whole pushchair folds on itself. You can then lift it with the handle and take it on the bus or put it in your car. To put the pushchair back up again you pull the handle bar into position then simply pull the clips up and flick the pushchair up into position while pushing down on the handle with your foot. I find the Loola a little heavy and do struggle to carry it around or up and down a few stairs but Mark is fine with it. I love the open basket. It is quite large and with being open it makes getting things in and out very easy although it is less secure than a closed basket, I much prefer the ease of an open basket. The basket is also very deceptive. When we first got the Loola I remember saying to Mark that the basket wasn't very big but when actually using it you can fit a lot of things in it. The brakes work well which is good to know. You have the red brake on the right hand side which puts the brake on and the grey one at the left takes them off. I do quite like this feature as our old pushchair just has the one brake in the middle but Marks finds that he sometimes catches his feet on the brakes and that if you don't push the release well enough that the brake sometimes flips back on again. I didn't think I would like the wheels on the Loola but I do. Our old pushchair has air filled tyres and I was a bit weary of using non air filled tyres but it wasn't as bad as I thought. Paige seemed comfortable and enjoys the ride. I love that to switch between swivel and locked wheels all you have to do is push the clip at the bottom side of the frame, making it easy to change between the two. One thing me and Mark both agree on is something that we don't like about the Loola, the handle. Because of the way the Loola folds the handle and the bumper bar are jointed so that they bend in the middle and can fold easily. With the bumper bar this isn't a problem but I feel like because of this extra joint the handle doesn't feel as sturdy. Of course it is sturdy but because of the joint in the handle when impact occurs (going down a curb) the joint moves a little, not enough to make it unsafe but enough that you notice it. Whereas if the handle was solid you wouldn't notice a difference. The handle has 4 different adjustments and we mostly use the third position. The first is in line with the frame, perfect for taller people. The second is pictured below, the third is parallel to the ground and the fourth is straight down which to me feels very strange but maybe if you were smaller than me it would work but it's a little too low for me. The Loola comes with the seat unit, frame, hood, bumper bar, car seat attachments and a rain cover. The rain cover is good, does the job well. It pops on over the seat unit and then simply pops off when you are done. The car seat attachments which come with the Loola turn it into a travel system, meaning that instead of the seat unit you can clip on a car seat, very handy with a newborn. Additional footmuffs can be purchased which are very well made and very comfy. A matching changing bag and umbrella is also available. Overall we love the Loola. I think that Mark prefers it more than I do and he feels like it is quite a manly pushchair and I would have to agree but that doesn't mean as a woman I wouldn't use it. The pushchair is easy to use although I wouldn't say it is easily pushed with just one hand, for me it is too heavy with Paige in to control with one hand. It is easy to put together and the instruction manual is easy to follow but I would like some words as the pictures aren't always too clear but it is easy to figure out. The Loola retails at £300 which I believe is a fair price, after all you are getting a well respected make and great pushchair which is also a travel system. It is also available in 3 lovely shades including a gorgeous pink which I love but Mark is very happy with the black. You can see the new Loola HERE on the Maxi-Cosi website.